I love Starr's work. It looks even more awesome up close. 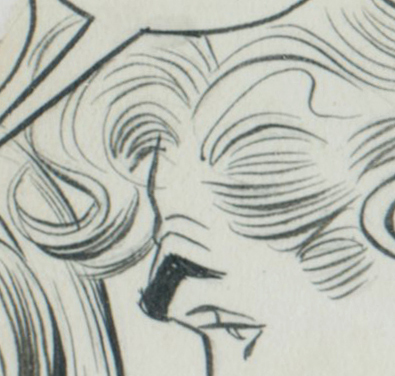 Starr, I think, is closer to Raymond as a fine artist in this style. 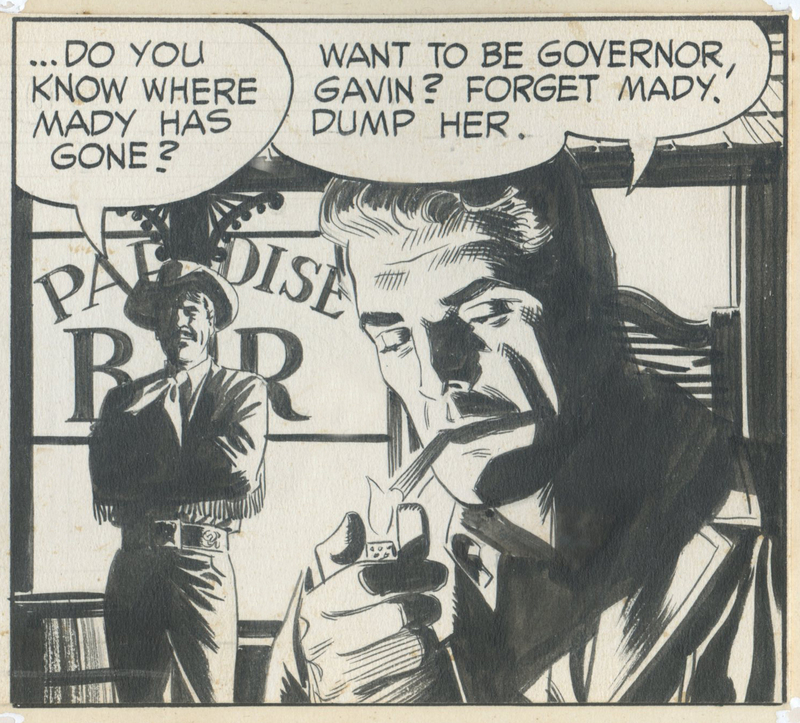 The chloroform panel and the chiaroscuro Mark Perkins establishing shot beneath it are beautifully composed and deftly drawn and inked. Who could ask for anything more from comics? I fail to see why refined, beautiful art has, by necessity, any less truth than “scruffy, unschooled” styles. Rather, I would think the reverse is true. The poetic processes of clarification and concision – that which ensures the beauty of meaning in communication - make manifest, and make room for, far more truth-telling than ugly efforts. When we see ugliness, which is by nature disorganized and illogical and full of insignificances like error and redundancy, the idea that most readily comes to mind is the ugliness itself. The same as in a sloppy essay where the points, if there are any amid the mental rubble, are both hard to extract and hard to pull together into a larger argument or idea. A crummy essay signals its confusion to us through its ugliness, which essentially equals its lack of meaning or poor presentation of its meaning. Meanwhile, an author with great clarity of mind can bestow twenty insights in five paragraphs. Such is generally understood as beautiful. Why is this so easy to understand in literature but so hard for literary types to note in Art? Yes, with nothing in particular clarified for meaning, and nothing in general organized for logic, the brutal and unrefined is more like the general chaotic experience of nature. In so being, though, it is less like the concentrated truth of anything requiring the insight of investigation and mental prowess, the very thing that raises civilization up from the muck. This is why ugliness in communication is demonstratively less useful, and thus less desirable, than the refined thought that creates meaningful beauty. This seems to be basic evolutionary epistemology. Mathematical formulas, which may be the closest human beings ever get to truths that approach universality, are themselves exemplars of idealism. This has been a very enjoyable series, David. Lovely pictures you put up, I keep going back to look at those crazy Murphy panels in particular. The Starr's compositional arrangements are great, they feel like stills from a movie but are much more fun to look at. I especially like the compositions in the last four drawings, where he creates great value shapes with his light sources. A clean look is more then just a clean line, it's understood form which creates such aesthetically pleasing value shapes, that fit together like a beautiful puzzle. One draws "clear," when one understands what one is doing. Reducing the value complexity of nature to a manageable few and in orderly manner is a sure sign of "clear," thought, which results in "clear," an often stylized design. The ability to discard what will not contributed to the picture and the knowledge to chose the major masses that give a picture an immediate organizing principal is a real skill and sign of intellegince. The man's outstretch arms, the woman in the bed, the man's face being lite up by the cigarette lighter are all made up of wonderful surprising well proportioned shapes. I like these older panel arrangements which to my eye look much better then the arrangement of panels in contemporary comic books. Which divide the space of the page too equally with the same repetitively long horizontal and vertical panels. Your comparison to the Greeks made me think, that the precise nature of their art, which is direct refection of their thought, would also be reflected in how they waged war. The world my be uncivilized, but discovering clear ordering patterns can give one group of people a great advantage over others. Well, to be honest the idealization in vogue seen here looks to be based on convention and not much more. It's mix-and-match of a cliched silhouette with a cliched mouth and cliched eyes. Not very different in construction from Manga, if you get there. It's just that one set of conventions are out, the other in. The classical greece's approach to idealizing beauty was very, very different. Kev Ferrara-- When Raymond died unexpectedly, King Features contacted Starr and asked if he would take over drawing Rip Kirby. 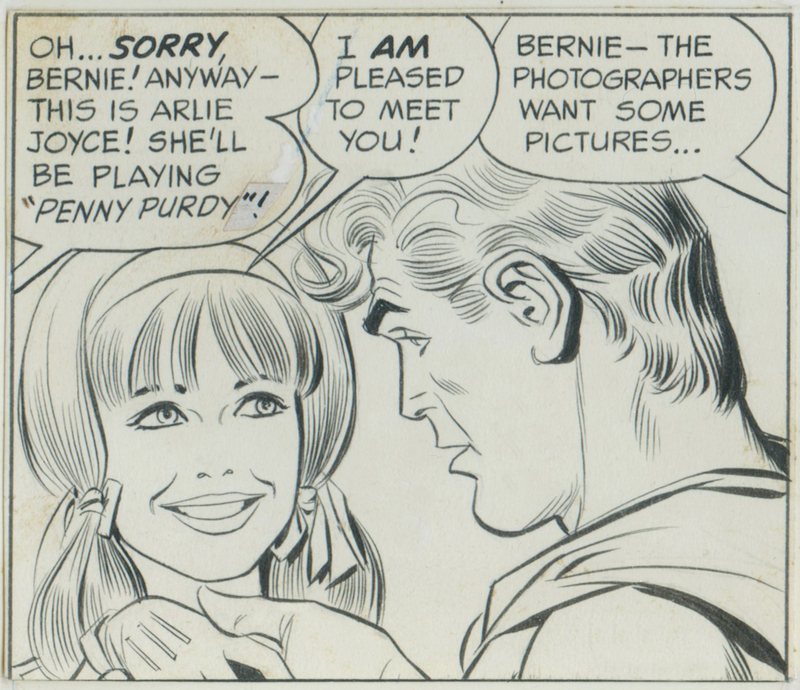 They surveyed the landscape of possible artists to fill Raymond's shoes and settled on Starr, but he turned down their lucrative offer because he wanted to start his own strip. "Mathematical formulas, which may be the closest human beings ever get to truths that approach universality, are themselves exemplars of idealism." Yes, in fact a large part of the ancient Greek focus on perfection on earth was based on their delight with the discoveries of math, (particularly by the Pythagorean brotherhood). Why the post-modern insistence that beautiful art must be less true than "scruffy, unschooled art"? It won't surprise you to hear that I have a theory for that too. Part of it, to be sure, is the sense that surface beauty is superficial and conceals the ungainly, the abnormal and the blemished. People pride themselves in being able to see past cosmetic concerns and focus in (sometimes all too clearly) on the flawed parts of our nature. But beyond that, I think that many artists who draw in a sloppy, clumsy way particularly with respect to underground comics, graphic novels, and similar popular culture, flatter themselves that their content is so moving and pure and true that accuracy or anatomical truth are only a distraction. Their expressive urgency or their sense of injustice or their sexual passion make straining for ideals of form irrelevant. I think this is a conceit that ignores the generation of artists who preceded us, who felt the very same passions just as intensely, but who put up a better fight to pursue artistic forms. Sidharth Chaturvedi-- Thanks very much, I'm delighted to hear it. xopxe wrote "classical greece's approach to idealizing beauty was very, very different." Can you give us a word or two on how you believe the approach of classical Greece was different? The Greeks had just as many misshapen citizens with warts and blemishes as anyone else. The golden age of Athens lived through a time of the plague. Yet one has only to look at their statues to see how they sought exemplars in glorious forms with heroic stature and proportion. The faces on those statues, with strong features and smooth skin, were intended to be the embodiment of perfection and despite the fact that they inevitably included cultural conventions (just as the Egyptians did before them and Hollywood and Leonard Starr did after them) the conventions of a healthy, strong, clear eyed male seem remarkably consistent across cultures and across years. You apparently think that combining "mix-and-match" features is very different from what the Greeks did, but isn't that exactly how Socrates said ideal beauty should be created? (See his quote in my post.) And Plato's philosophy centered around his belief in ideal Platonic "forms" that exemplified the less perfect variations on earth. Li-Ann-- I'd welcome the same input from you. If you think Starr's figures are derivative of Hollywood, then have you considered that Hollywood's figures may be derivative of Greece's? David, your argument gets a bit muddled if you start to talk about the beauty of the characters within the strips as oppose to the beauty of the drawing itself. a great draughtsman should be able to draw ‘ugly’ subject matter and the drawing will still be ‘beautiful’ … (if we’re agreeing with Kev’s "...poetic processes of clarification and concision – that which ensures the beauty of meaning in communication” above). there are also clearly good ‘ugly’ drawings (in both style and content) - Egon Schiele, Ronald Searle and Erich Sokol ('American Natives') come to mind - as oppose to just ‘sloppy, clumsy’ drawings. i know you agree here as you mention Kathe Kollwitz a lot, so it seems (as i nearly always seem to end up arguing) that certain styles suit certain content. for me the beauty of painting or drawing is in seeing how the subject matter is illuminated by a specific stylistic take; when it works it feels as if the poetic /stylistic / suggestive devices are 'definitive' (for said subject matter) in some way. "Yes, in fact a large part of the ancient Greek focus on perfection on earth was based on their delight with the discoveries of math, (particularly by the Pythagorean brotherhood)." Doesn't math encompass numerical patterns and geometry is math applied to shape? Proportion, ratio, symmetry have all become part of the vocabulary of art. The classists obsession with rigorous quantification, exactitude and detail has its roots in divinatory thinking. As J.L. Heilborn wrote in Geometry Civilized,"...the origins of geometry might be better sought in religious ritual then in land surveys." But if your culture is "selling style," it probably hasn't delved very deeply into the nature of things. I think fashion might be a better word then style. The shapes of post modern art may be uglier then the preceding generations but maybe its because everyone is more aware of the lies its selling. The content has not really changed, only how it is presented. It is clothed in a new fashion. The pretense so to speak has disappeared. Everyone is in the the joke. Everyone doesn't want to be a hero or a damsel. You can be a hero or a slob as long as you buy what where selling, that's as far as our concern for "style," goes. Or here, draw Dagwood instead! Of course faces are a mix and match of *features*, that's how genetics works after all. What I mean is that what we see here is a mix and match of conventional representations. Look at the girl in the first panel. Her mouth/nose/cheeks have been drawn like that zillions of times, to the point they do not represent any real feature set. They're just a symbol for beauty. Yesterday on the bus I saw a beautiful woman, with thin lips, protruding cheekbones and almond shaped and slightly narrow eyes. Had she been a character here, and drawn in this style, she would be way out of place. Greeks attempted do find the purest representation of a real, individual, face, so you'll find tons of interesting faces in greek art. What we have here is much more egiptian, where the style of representation doubles for expression. This is also true for popular and decorative greek art, with standard silhouettes and hand gestures. This works pretty well when you're trained in the conventions and language, but otherwise looks shallow. Just make the exercise of getting a bunch of eyes drawn like here, and put them side by side with a bunch of Manga eyes, and you'll see what I mean. I wanted to point out that "idealism" isn't simply shooting for iconicity in the sense of Platonic perfection. If such a simplistic heuristic were applied to anything it would become a mess because there would be no temperance, no contrast, no focus. To search for the ideal is not fantasy or religion or a mere decorative attempt, but a search for the actually meaningful and the actually true, the essential amid the confusion; that which is most useful. For a storyteller, it also means using the most telling and clear means to put the idea across. In other words in art idealism means shooting for situational perfection or optimizing for the expressive task. John Opie in his famous treatise on painting noted "The ideal, if it mean anything, means the selection and assemblage of all that is most powerful and best calculated to produce the wished-for effect, and relates to the management of a whole composition, and to the just delineation of a bad moral character as much as that of the most beautiful and amiable." Mr. Apatoff, thank you for these posts. I would like to posit a couple thoughts on why there is not as much clean line in use today that I would be interested in your opinion. My first point is that perhaps there is not as much vocational training for artists or illustrators in this style of rendering with a dip pen or brush and ink. I taught myself how to use these tools. In high school art in the 80's rapidograph pens were the closest I came to being taught how to draw with ink, which do lend themselves to the lush line work shown in these posts. My second point has to do with technology driving some changes in style. There has not been any comments about the size in which there illustrations were drawn. When drawing at a larger scale the illustrator has much more freedom to move the whole body when drawing lines and is not just limited to the wrist. I find I can generate smoother lines when my lower back, shoulder and elbow are all working together. The larger scale also allows for a little wiggle room for imperfections in the line that will generally not be apparent when reduced. It also allows for more detail work. Back in the day original artwork was sent somewhere to be photographed or run through a photostat (I believe). This allowed the illustrator to create the art at whatever scale was required for their style or medium. Today it seems most end users of illustrations want things digital. If the illustrator's artwork uses traditional media, then it must be digitally photographed or scanned. Most scanners are set up for letter size or at best 11"x17". If the illustrator limits the artwork to this scale, some of the benefits of drawing at a large scale are lost: more cramped body motion, more line imperfections show through and detail work becomes more challenging. This might explain why many illustrators have switched to pure digital art. The canvas size is unlimited and digital brushes can be adjusted to smooth out minor imperfections. It also avoids the analog to digital conversion of the art. Your posts definitely elicit some deep philosophical discussions! Well, those compositions aren't necessarily brilliant though are they? Tom wrote: "A clean look is more then just a clean line, it's understood form which creates such aesthetically pleasing value shapes, that fit together like a beautiful puzzle. One draws "clear," when one understands what one is doing. Reducing the value complexity of nature to a manageable few and in orderly manner is a sure sign of "clear," thought, which results in "clear," an often stylized design. The ability to discard what will not contributed to the picture and the knowledge to chose the major masses that give a picture an immediate organizing principal is a real skill and sign of intelligence." That's probably a better way of putting it. The lines in this and earlier examples are not just clean, there is a clearness and confidence and certitude to them which comes from investing the time and effort to study natural forms and draw conclusions about them that I enjoy. We may be living in an era when many feel that confidence is overblown or unwarranted, and that a wavering, uncertain line shows more self-doubt and sensitivity about the world. Or many feel that a scribbled, hasty line reflects a casualness about the world which they prefer to a careful approach where shapes "fit together like a beautiful puzzle." There are times when I admire this kind of line as well. But I think the people who turn up their noses at what you call a "clear" talent are missing "a real skill and sign of intelligence." When I discuss the reasons for their intolerance and even antipathy for this kind of look, I usually find myself unimpressed. I encounter a lot of adolescent cynicism about the world, a fair amount of ignorance about what goes into quality work of this nature, and more than a whiff of jealousy or resentment. One thing I enjoy about the discerning eyes of this group is that they can look at two examples of "clean sharp" artists, both demonstrating great technical proficiency, and assert that one makes the grade and another doesn't (for example, Raymond and Drake). That tells me that people understand whats going on beneath the surface, that more is required of this style than simply a photographic likeness. That helps me sharpen my own ability to assess the qualities of this look. Laurence John wrote: "David, your argument gets a bit muddled if you start to talk about the beauty of the characters within the strips as oppose to the beauty of the drawing itself." Tom wrote: "Doesn't math encompass numerical patterns and geometry is math applied to shape? Proportion, ratio, symmetry have all become part of the vocabulary of art. The classists obsession with rigorous quantification, exactitude and detail has its roots in divinatory thinking. As J.L. Heilborn wrote in Geometry Civilized,"...the origins of geometry might be better sought in religious ritual then in land surveys." As Heilborn suggests, quantification is not totally separate from subjective qualitative issues (or "divinatory thinking.") Returning to Pythagoras, Arthur Koestler wrote, "[Pythagoras'] influence on the ideas, and thereby on the destiny of the human race was probably greater than that of any single man before or after him.... [His] was the first successful reduction of quality to quantity, the first step towards the mathematization of human experience-- and therefore the beginning of science. Pythagoras discovered that the pitch of a note depends on the length of the string which produces it, and that concordant intervals in the scale are produced by simple numerical ratios." Tom also wrote; "The shapes of post modern art may be uglier then the preceding generations but maybe its because everyone is more aware of the lies its selling. The content has not really changed, only how it is presented. It is clothed in a new fashion. The pretense so to speak has disappeared." From my perspective, the "ugly" manner of presentation (for want of a better term) has been dominant in some quarters for so long that many of its adherents have become shameless and superficial. They take too much easy joy in seeing what is low in people, and too lazy about investigating the truths in the idealized images. Norman Rockwell turned out his share of scented bilge over his long and prolific career, but if you focus on his best work, it seems to me that his pictures of idealized people had more intelligence and insight into human nature than the vast majority of "ugly" art, and is more true too. I'm happy to take that battle up with specific examples, if folks out there want to engage with it. And just to clarify for purposes of Laurence John's point, I think "the beauty of Rockwell's drawing itself" (in addition to his idealized characters) are superior. xopxe wrote: "Of course faces are a mix and match of *features*, that's how genetics works after all. What I mean is that what we see here is a mix and match of conventional representations. Look at the girl in the first panel. Her mouth/nose/cheeks have been drawn like that zillions of times, to the point they do not represent any real feature set. They're just a symbol for beauty." I think it's pretty clear that Socrates (who was personally reputed to be an ugly man) was not saying that genetics gives everyone eyes, noses and mouths. He was saying that we have identified certain types of features as archetypes, and that maximizing them may result in a rare combination of attributes, but that doesn't make them "false." Many people have speculated about what makes those forms attractive. Many suggest that it is a biological vision-- we are sexually attracted to beings that radiate strength, healthiness, etc. for reasons related to perpetuation of the species. There have been just as many people who have emphasized that beauty is only skin deep, and taste is relative, so we might be attracted to someone like the girl you describe on the bus. So I don't think there is anything startling about your seeing the beauty in a girl with "thin lips, protruding cheekbones and almond shaped and slightly narrow eyes." I think what you mean with archetype is what I meant with face features. They do repeat and mix, as is easy to see watching family photos that span several generations. What I say is that the representation I see in these drawings completely obliterates any real-life image I can have. It just does not evoke any real face to me (this does not happen so strongly with male faces, for some reason). And that is what I use "just symbols". If it does not evoke anything visually, then it could have been literature for all purposes. And the evocative power of that drawing is spent on me. I see it just stilted and generic imagery. And that is why I mention needing training as a observer: perhaps for someone who lives in a different visual landscape and spends the time needed to assimilate the language that does work, like for you. And the girl in the bus was beautiful, I'm pretty sure half the passengers would agree. She had one of those triangular faces, sort of like the lady with the ermine, but with indian eyes. Our faces are symbol systems. The elements, our features, are typographic in essence. We each have our own typeface, so to speak, which makes it easier for us to express certain ideas facially rather than others. But we are all, more or less, speaking the same universal language through our shared physiognomic conventions. So long as a work of art contends with the variations in human “typefaces”, it is being realistic. Drawing humans cannot escape patterning, because there are indeed archetypes, common characters and characteristics among humans. In the grand scheme, we are all stock characters with stock features. Only our thoughts and experiences distinguish us. So it would be quite a negative stretch to put visual characterizations down as necessarily dogmatic or cliché. In fact, to be against character archetypes is to risk being indistinct and nondescript. That’s a danger, as in art and in all narratives generally, one of the chief necessities is to be specific and clear so meanings can be distinguished. The real issue is whether the artist is vivifying the visual conventions and bringing them alive as part of a distinct imagined world in the mind of the viewer. In comics, as in all art, this endeavor goes on between and within what is drawn, and not in what we see. Artistic talent and intent and fresh observation, then, is what keeps archetype from becoming stereotype. 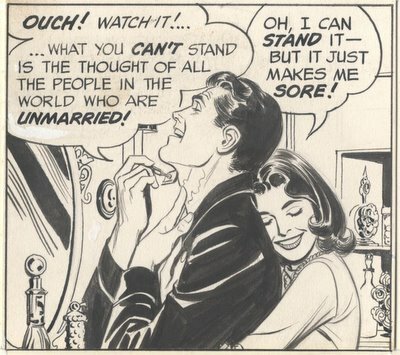 i know what you mean, and i have similar issues with this style of comic art for similar reasons. it’s much easier to draw a craggy old man in black ink on white paper because there’s more facial topography to dig into. pretty young women are probably the hardest to do because the subtler, softer shapes give you less to define. too often this ends up with the kind of generic pretty-girl features you’re talking about; the barely-there nose, the perfect heavily mascara-d eyes. part of the risk with any style of art is that it can reduce to a set of visual clichés. 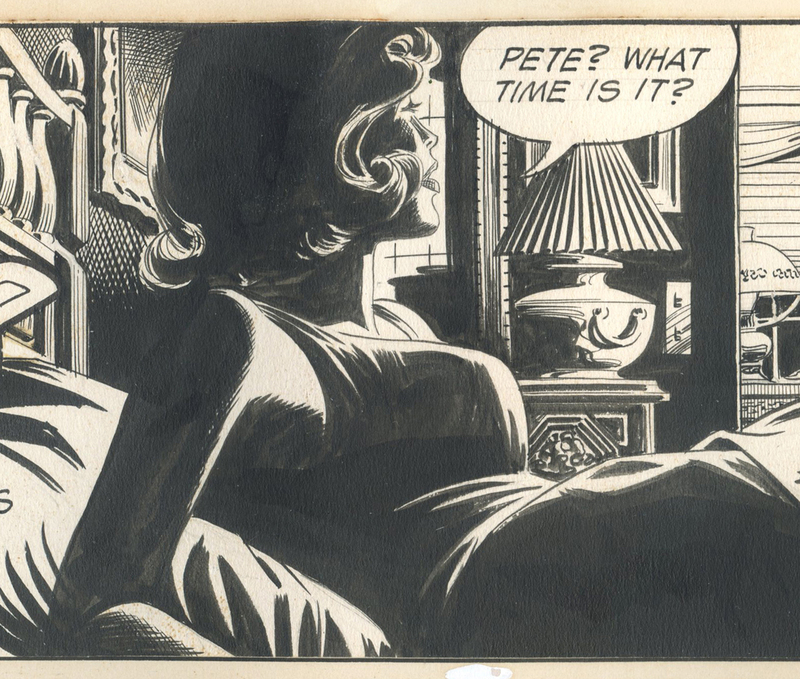 i think this type of high-contrast, black ink on white paper, comic art (from whichever country) has been especially susceptible to that problem. "...part of the risk with any style of art is that it can reduce to a set of visual clichés. i think this type of high-contrast, black ink on white paper, comic art (from whichever country) has been especially susceptible to that problem." Yes, indeed. Comic art also has been very good at overcoming that problem.